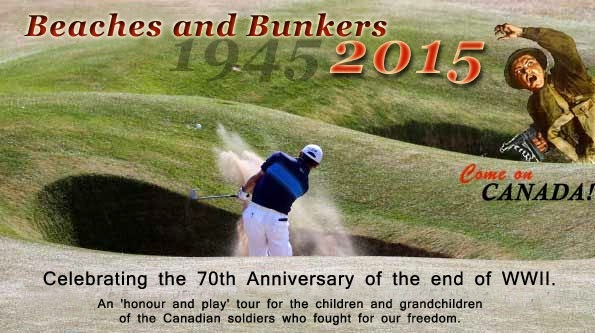 honour our country's past, our fathers and grandfathers... and play the game we love. My father landed on those beaches. He was a 'Gunner', commanding one of three batteries of 25 lb. guns in the 6th Field Regiment, 2nd Canadian Division. I never learned anything of his experiences when I was a kid except that, as a scratch golfer, he carried his good luck three iron throughout the war! When he couldn't play anymore in his mid-70s, he rode in a cart while I played. During these rounds I began to ask him 'what happened?' On the 50th Anniversary of D-Day we went back to the beach, and then followed his footsteps of 1944-45 thru France, Belgium, Holland and Germany. 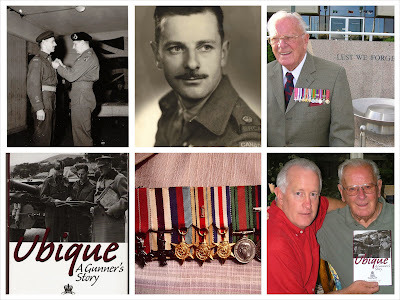 A few years later, at the age of 87, Dad wrote his stories in "Ubique - a Gunner's story". He died five years ago. I treasure the book and the experience. But so many Canadians don't know what happened to their fathers, grandfathers & uncles 'over there'. 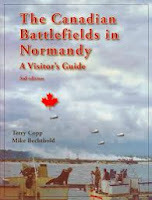 "Beaches and Bunkers" is for those who want to learn the story of our vets' experience in 1944-45. And it's for those who want to enjoy the company of others who are learning too... while we play the game our fathers and grandfathers loved. Free afternoons to wander key sites... like Dieppe, the Bayeux tapestry etc. Golf clubs provided. Just bring your shoes and your favourite 'can't be lost' ball! We are delighted and extremely lucky to have Terry Copp lead this tour. A long-serving and charismatic professor at Wilfrid Laurier University and the founder of the Laurier centre for Military Strategic and Disarmament Studies, Copp is the leading scholar of Canada’s military role in World War II and an influential advocate for military history in both military and civilian post-secondary education. 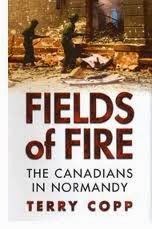 His work on battle exhaustion, published in 1990; his study, The Brigade (1992); and his two important volumes on the Canadians in Normandy, Fields of Fire (2003) and Cinderella Army (2006), have led to a reinterpretation of Canadian soldiers’ effectiveness in 1944 and 1945. Copp’s interest in the battlefields of northwest Europe has also led to the creation of battlefield memorials, the conduct of tours for teacher and students, and the publication of invaluable battlefield guides to Canadian participation in both world wars. He is the founder of a quarterly journal published by the Laurier Centre in co-operation with the Canadian War Museum; entitled Canadian Military History, it is Canada’s leading journal of military history. Find out why the Oxford Companion to Canadian Military History calls Copp a "charismatic teacher." Terry will be with us every step of the way. The more you know about your father or grandfather's experience, the more Terry will help you understand what happened to them after landing on that beach. You can decide to be 'All Honour', learning from Terry all nine days. Or you can be 'Honour and Play', taking four half days off to play the game you, I and my Dad loved (golf!). JUNE 22 Arrive at Charles de Gaulle Airport in Paris and take a shuttle bus to our airport hotel to deposit luggage +/or check-in (depends on time of arrival). The Hotel Novotel Paris CDG Terminal is located at the heart of Roissy CDG airport, just 30 minutes from Paris. This is a free day for visiting Paris which can be reached from the airport via train or taxi. Return to the hotel to meet Terry and each other... and have our first dinner. 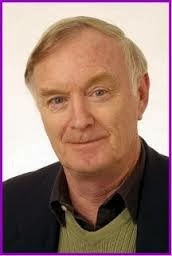 Our special guest speaker will be Keith Spicer, Canadian journalist, diplomat, raconteur and author of "Paris Passions. Watching the French being Brilliant and Bizarre." Keith lives in Paris, and his enlightening and humourous talk will delight you: "Three skills every Canadian needs in Paris". Get to know Keith by taking a look at his "Paris for Seniors" site. ashore were either killed, wounded, or captured. 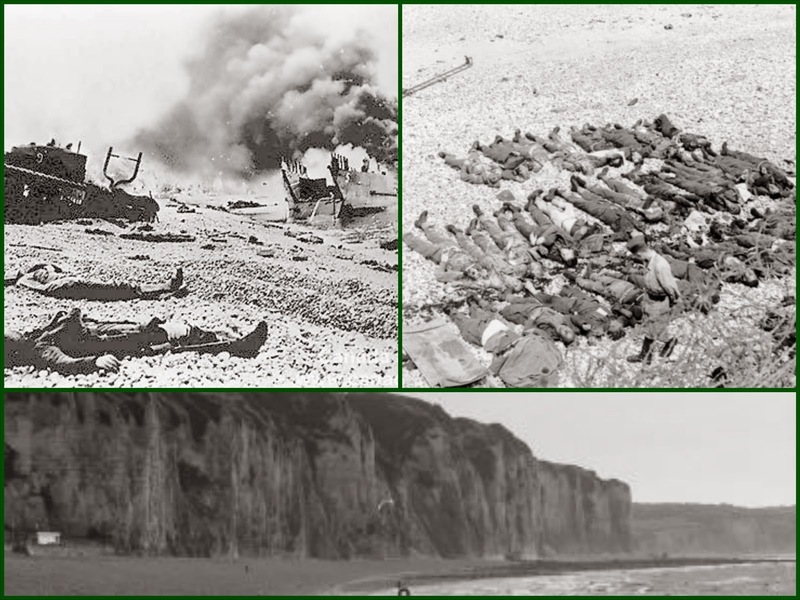 JUNE 23 After breakfast we depart for Dieppe to see that beach which was stormed on August 19, 1942... and find the “lessons learned” for D-Day. You will stand on that gravel shore and wonder: what were those people in London thinking? Enjoy lunch at one of the many harbourside cafés. Late afternoon is free to climb to the German emplacements and wander town. Group dinner. Africa and Italy, 1939-45. 45,000 didn't come back. whose fathers and grandfathers fought with yours. 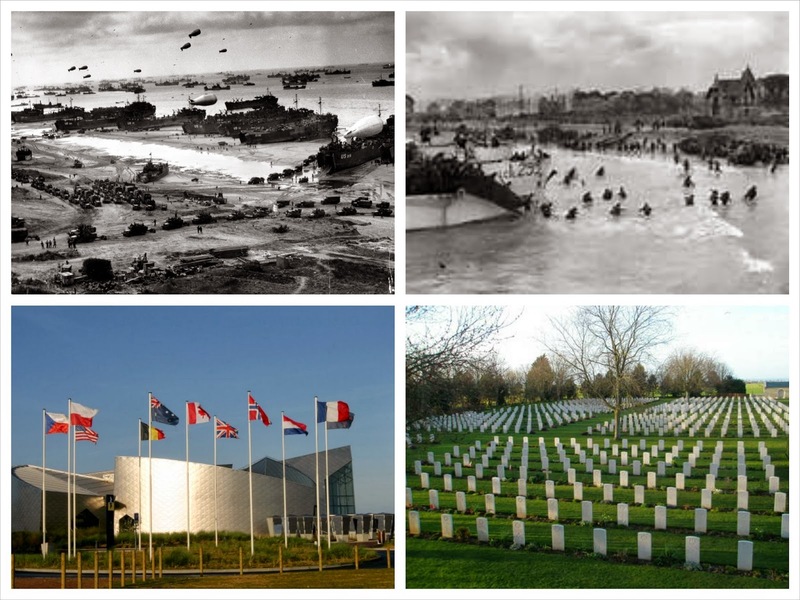 JUNE 24 We depart for Lower Normandy, visiting Pegasus Bridge and the memorial to 1st Canadian Parachute Battalion who jumped out of the clouds on the night of 5/6 June. 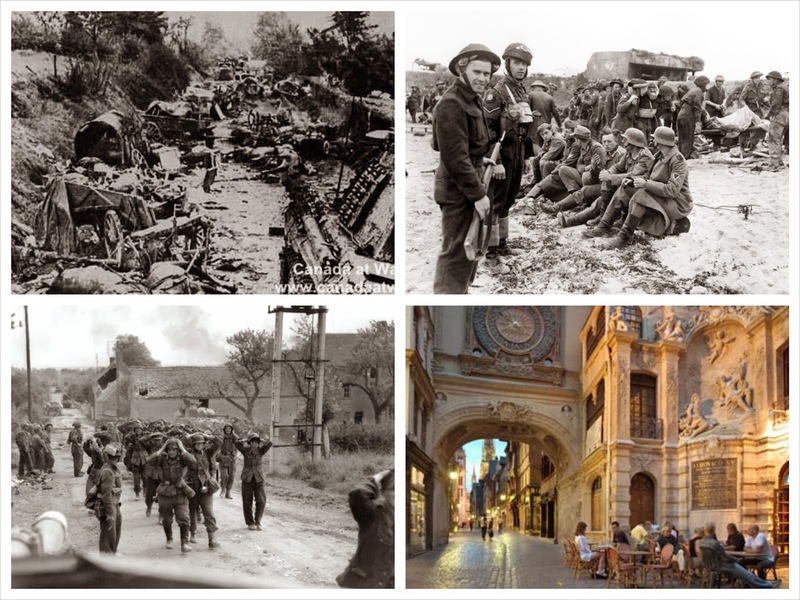 We begin our exploration of D-Day at the Juno Beach Centre where the Royal Winnipeg Rifles landed before touring the rest of the Juno sector and visiting the Canadian military cemetery at Beny-sur-Mer. IF time available we retrace the Canadian advance inland, visiting the Canadian Memorial Garden and the Abbaye d’Ardenne before returning to our hotel. Box lunch... and Dinner on your own in Bayeux. the remains of 9,387 American soldiers. 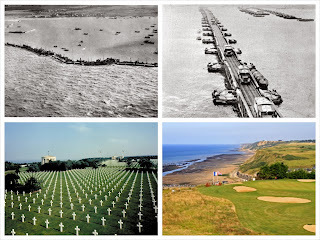 JUNE 25 We start our day with a visit to Omaha Beach and the American cemetery featured in the opening shots of “Saving Private Ryan.” Having seen Dieppe, you will wonder why the Allies chose to land here. The nearby gun battery at Longues-sur-Mer, the only coastal position left with guns intact is our next stop, followed by Arromanches where we'll see the remains of the Mulberry Harbour towed over from England. 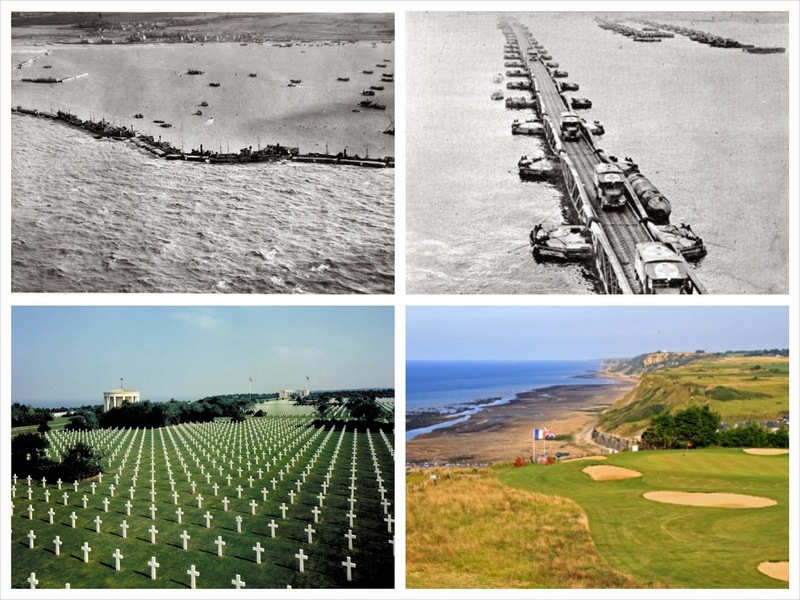 Late afternoon options: 1) explore the town and visit the famous tapestry; 2) Play golf at the Omaha Beach Golf Club. Box lunch and Dinner on your own. 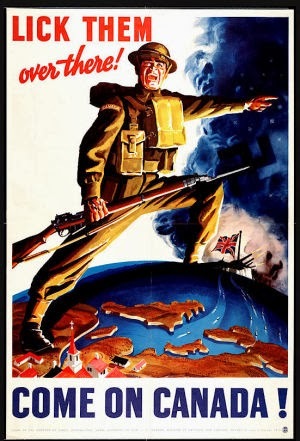 and 250 guns were destroyed or abandoned. JUNE 26 We follow the Maple Leaf Route south to Falaise with stops at the Verrieres Ridge Memorial Park, the Canadian and Polish Military cemeteries, and the memorial to the British Columbia and Algonquin Regiments before driving to St. Lambert-sur-Dives where the Canadians, Americans, and Poles finally closed the Falaise Pocket. We continue along the path followed by the Canadians to our hotel in Rouen. Box lunch & Group dinner in Rouen. 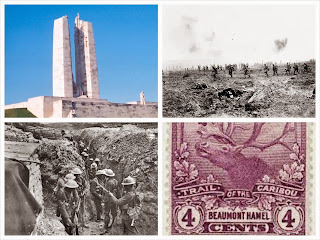 JUNE 27 We head north towards Holland via Beaumont-Hamel where the Newfoundland Regiment was virtually wiped out on July 1, 1916, the first day of the Battle of the Somme. Then on to the awe-inspiring Canadian memorial at Vimy Ridge near Arras where, from April 9-12, 1917, four divisions of the Canadian Corps took control of the German held high ground ensuring the south flank could advance. After a box lunch we drive north to Bergen Op Zoom for a special dinner. JUNE 28 Golfers will play Golfclub Wouwse Plantage, a forest course founded in 1973. 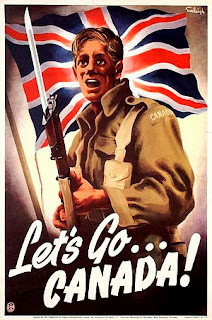 Non golfers will visit the battlefields of October 1944, the operations to open the vital port of Antwerp. The only time in history a Canadian commanded British,American,Polish and canadian troops in one of the major battles of the war.We will visit Woensdrecht,The Causeway to Walcheren and Westkappelle. Drive to Amsterdam in afternoon, evening free. 1. 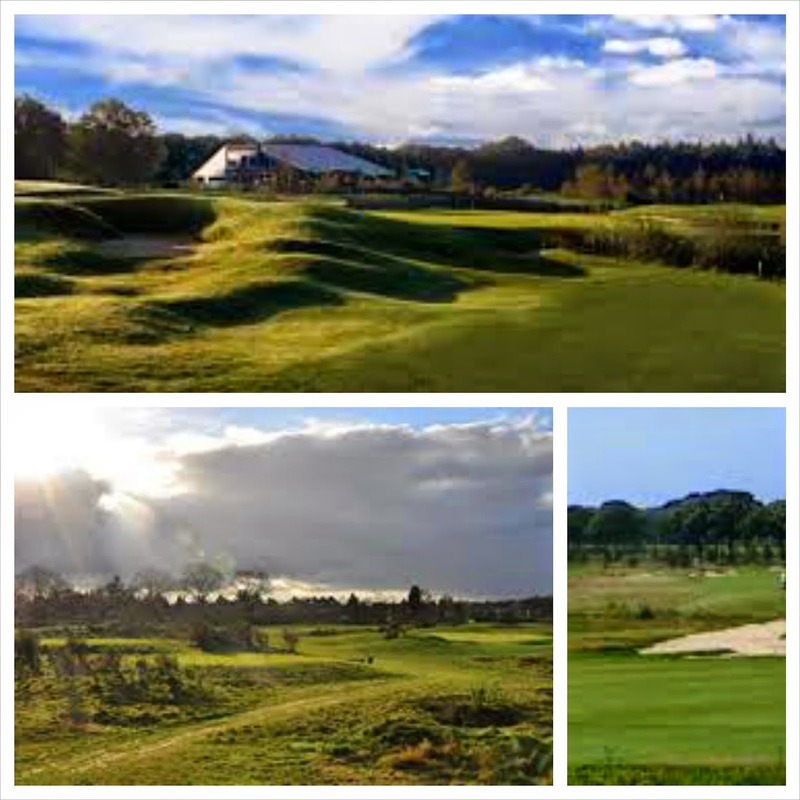 Golfcourse Het Rijk van Nijmegen, 45 holes - from tree lined to hidden, 75 bunkers and stunning views all the way to Germany. 2. 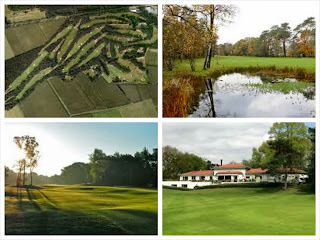 Golfclub De Heelsumse, lying in the veluwezoom near Arnham. A classical links course and golf as it was originally intended! Non golfers will travel to Arnhem to examine the Airborne landings and the Bridge too Far . We then have the late afternoon 'off', then putting on a clean shirt for a fabulous dinner at the Dutch Resistance Museum. 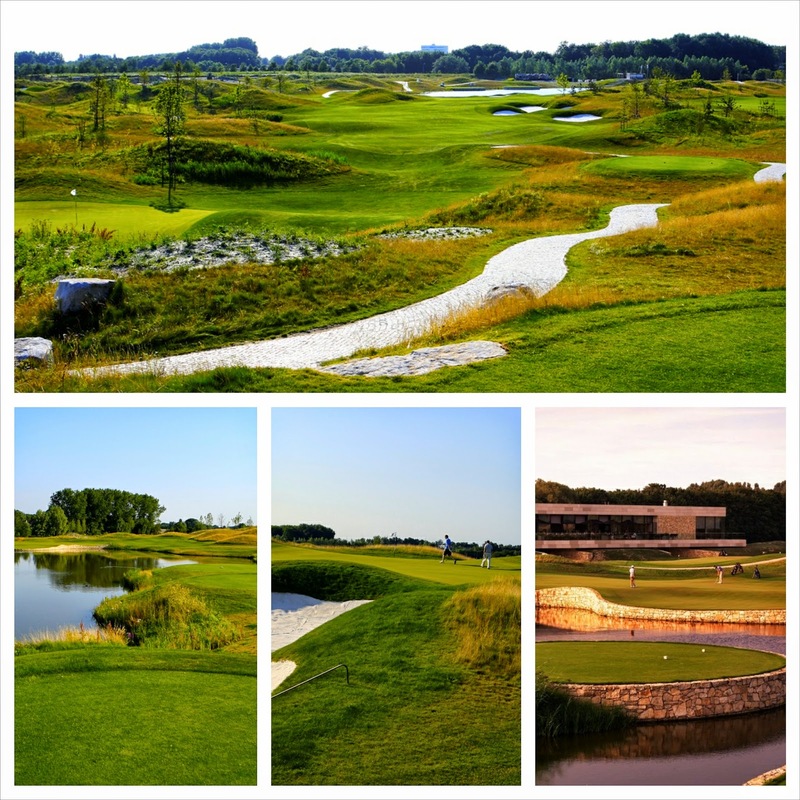 JUNE 30 Golfers will play The International, designed by Ryder Cup Captain, Ian Woosnam. A golf course of international allure that will deliver a unique experience. Non-golfers - a free day to explore Amsterdam. We then join each other for a final group dinner at a 'let your hair down' Dutch pub! JULY 1 Fly home (or continue your European visit). As you'll be making your own flight arrangements, we suggest you fly into Paris, and at the end of the tour take the train from Amsterdam back to Paris for the flight home. Lloyds Travel can help you with this. An evening with Keith Spicer as he reads from his book "Paris Passions"
$500 must be deposited by January 1, 2015 to secure your seat on this tour, as we are only taking 36 guests. The balance of your final cost must be paid by February 15, 2015. To secure your spot, please contact blair@lloydstravel.com, or call her at 1-800-800-7252. We love the sport... but our clubs are a bit of a pain to carry around the world, n'est ce pas? We have a solution. We have arranged to have the clubs below available to everyone. All you need to bring is your shoes, glove, and your never-can-be-lost ball! The IX-5 half set consists of: irons 5-7-9-SW, a 3-Wood, a mallet-putter and a small standbag. The IX-5 mens series are made of a high quality stainless steel and fitted with True Temper steel or Skymax graphite shafts. The wider sole makes this series easier to play for beginners and recreational players, but also advanced golfers assess these clubs as being comfortable and stable. Available in both left and right-hand. The IX-5 half set consists of: irons 5-7-9-SW, a 5-Wood, a mallet-putter and a small standbag. 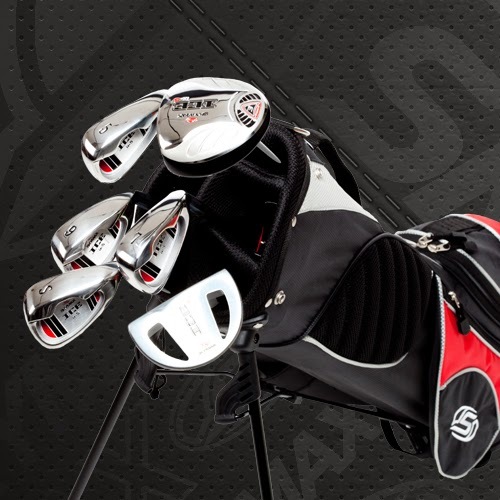 The IX-5 Ladies Graphite series is made of a high quality stainless steel and fitted with Skymax graphite shafts. The wider sole makes this series easier to play for beginners and recreational players, but also advanced golfers assess these clubs as being comfortable and stable. Customizations, like other lengths, grips, degrees, bag or a different composition, are included in the price! Available in both left- and right-hand. The reason to use these clubs? There's no room in the bus. If everyone brought their clubs we would need another vehicle to transport them. 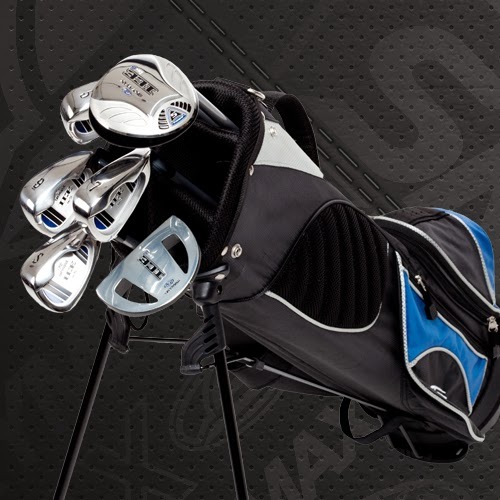 These clubs are included in the tour, and will be waiting for us at each golf course. Thank you to these organizations who want their members to experience a unique golf holiday! My name is Robb Lucy, and I'm the son of a Canadian vet. 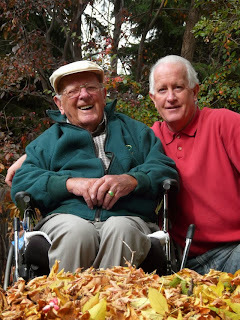 I took my father back to the beaches of Normandy for the 50th Anniversary, and we followed the 'tour' he took 50 years earlier. This time he used his three iron as a cane. We visited many of the spots where his experiences scarred him, shaped his character and confirmed his philosophy of life. I'm pleased to see so many of us at our local cenotaphs each November 11, but saddened so few really understand what happened 70 years ago. May this tour be an admonition for you not to let the stories of your parents and grandparents disappear. These experiences forged their tools for life. And it is with those tools they raised us. You can leave a comment below for everyone to see. Or if you want a private answer, please email me at rlucy at eyelearner dawt cawm. And please leave a message just below here where it says "Comments". Let others know you're coming... and why you like the mix of 'Honour' and 'Play'?